An indicator of round levels. A range of important price levels with sound and text alerts, which are generated when the current Bid price of a currency pair is equal to a round number. This indicator visually shows the trader true support and resistance levels, which are used by most of traders and trading robots. The advantage provided by this indicator is that the trader using this indicator on a chart does not need to draw any additional levels. Round price levels represent a certain barrier, so we can say that price values ​​that are multiple of one hundred (00) can be used as support/resistance levels for the price. For investors working on higher timeframes or smaller intraday timeframes, it's easier to memorize the round number by tracking the price dynamics of financial instruments. This is a common human desire to simplify things. Traders also prefer simpler ways. Therefore, the multiples of a hundred are so attractive. So, the real fight between bulls and bears often happens on levels like 1.23000, 1.4000, 1.23500 etc. By determining who won in the moment based on the rebound or breakdown at these levels, we can join the majority of open orders in the market. When opening deals at a breakout of these level, which happen more often according to statistics, we can place a Take Profit at the next price level and thus set the minimum reserve for the price movement. 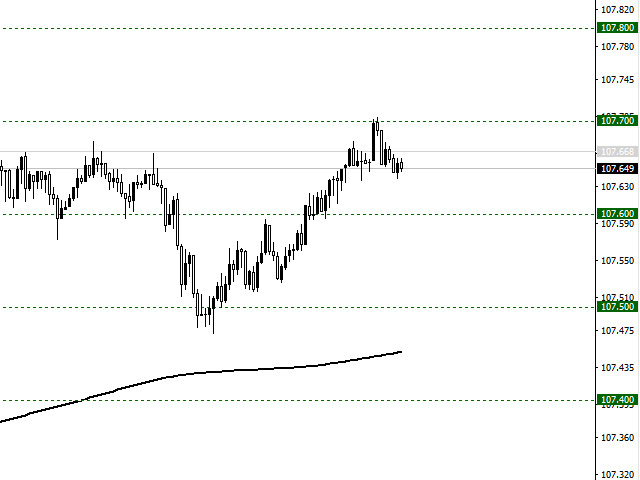 When price breaks and consolidates near a round level, we can open deals expecting the continuation of the movement, as the price barrier was passed, and set A Stop Loss behind the broken level thereby setting our risks. Alerts can be enabled in indicator parameters. 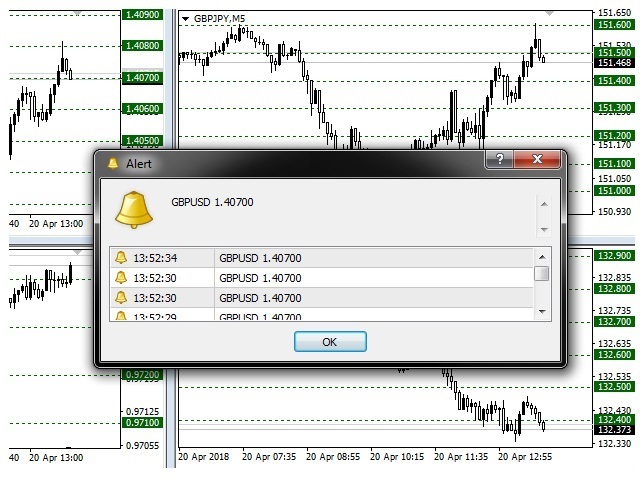 When AlertPlay = true, the indicator will show a dialog box when the currency pair price reaches a round level. The alert contains information on the currency pair and the current bid price. Also, when a level is touched, the standard "alert.wav" sound is played. Show 00 Levels – show the absolute round level, default is true. Show 10 Levels – show a round level multiple of a hundred, default is true. Show 20 Levels – show the 200th round level, default is true. Show 30 Levels – show the 300th round level, default is true. Show 40 Levels – show the 400th round level, default is true. Show 50 Levels – show the 500th round level, default is true. Show 60 Levels – show the 600th round level, default is true. Show 70 Levels – show the 700th round level, default is true. Show 80 Levels – show the 800th round level, default is true. Show 90 Levels – show the 900th round level, default is true. Levels 00 Color – the color of the absolute round level, default is DarkGreen. Levels 10 Color – the color of the round level multiple of a hundred, default is DarkGreen. Levels 20 Color – the color of the 200th round level, default is DarkGreen. Levels 30 Color – the color of the 300th round level, default is DarkGreen. Levels 40 Color – the color of the 400th round level, default is DarkGreen. Levels 50 Color – the color of the 500th round level, default is DarkGreen. Levels 60 Color – the color of the 600th round level, default is DarkGreen. Levels 70 Color – the color of the 700th round level, default is DarkGreen. Levels 80 Color – the color of the 800th round level, default is DarkGreen. Levels 90 Color – the color of the 900th round level, default is DarkGreen. Width 00; 10; 20; 30; 40; 50; 60; 70; 80; 90 - the width of round levels, default is 1. Level Style - the styles of round levels with the width of 1, default is Dot. AlertPlay - enable/disable the sound and text alert, default is false (disabled). Note: the indicator can be used on all trading instruments. The recommended timeframe is M15. 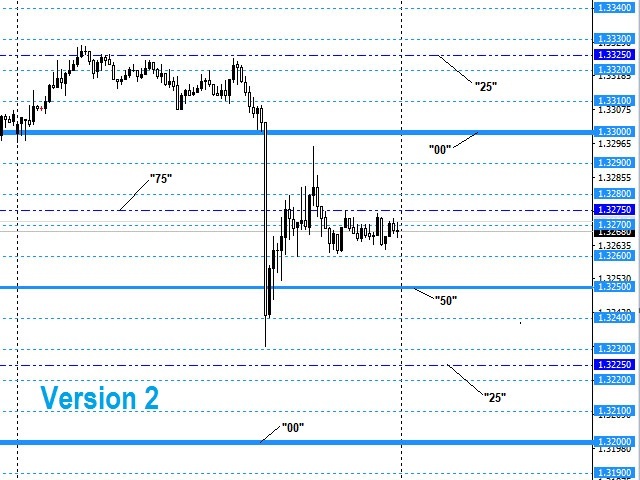 Round price levels can be disabled on higher timeframes. Добавлены промежуточные уровни "25" и "75". Стили, цвета и толщину уровней также можно менять. Примечание: Стиль всех линий меняется только, при толщине: 1.